The National Gallery is fortunate to possess this country's finest collection of paintings by Raphael, the youngest of the three artists whose styles epitomize the High Renaissance. What Leonardo achieved by sheer intellect and Michelangelo through passionate intuition, Raphael acquired by persistent study and assimilation. Through the works in this room we can trace the process by which he transformed the fifteenth-century style of his earliest teachers into something new and of enduring influence. For later generations, Raphael's art came to represent an ideal of perfection, the very definition of easy grace and harmonious balance. Raphael must have studied first with his father, a painter at the court in Urbino. After his father's death, Raphael entered the workshop of Perugino, whose graceful, open landscapes and gentle figures were widely admired. An adept student from the outset, Raphael mastered his teacher's delicate, ornamental style. Late in 1504 Raphael moved to Florence, where he responded quickly to the innovations of Florentine painters, especially those of Leonardo da Vinci. Leonardo's works must have seemed stunningly new. Softly shadowed forms recreated the appearance of reality to an extent never before achieved. Figures were convincingly integrated into their settings and related naturally to each other. In the words of Vasari, a sixteenth-century artist and biographer, Raphael "stood confounded in astonishment and admiration: the manner of Leonardo pleased him more than any other he had ever seen...."
Raphael's artistic evolution continued when he moved to Rome in 1508. There he was influenced not only by the idealized, classical art of the city's ancient past but also by the more energetic and physical style of Michelangelo, whose works he also had studied in Florence. Once considered to be an early work by Raphael, this altarpiece is recognized today as one of Perugino's most successful. Its cool, silvery atmosphere and poetic mood are typical of what a contemporary described as Perugino's "aria angelica et molto dolce" (angelic and sweet air). The work's quiet piety differs from the more intense emotion found in many crucifixion scenes. Elevating Christ's body high over the landscape seems to raise him literally above human suffering. The saints who witness the event appear more grave than grief-torn. Some of the figures apparently were painted from the same model in Perugino's large and busy workshop. Compare, for example, John the Evangelist, at the foot of the cross, with Mary Magdalene in the right-hand wing. Except for a slight variation in their hands, their poses are identical. Even their expressions are the same. When this altarpiece was completed, the artist was reaching the height of his popularity and receiving prestigious commissions. Later, however, Perugino found his style to be outmoded and his work criticized for its over-reliance on stock figures and formulaic compositions. Raphael was in Florence from late 1504 until 1508. Seventeen images of the Virgin and Child from those few years survive today, two of them are on this tour. Probably many of these works were made for the art market—images of the Madonna and Child were often given as wedding presents—rather than to fulfill a specific commission. The Small Cowper Madonna mirrors in style and sentiment what Raphael had seen, and helped produce, in Perugino's workshop. 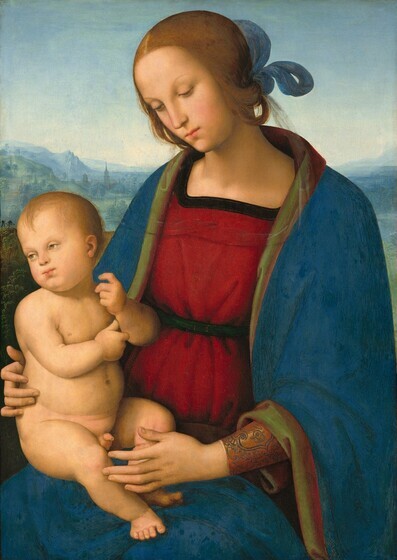 Compare it with Perugino's own Madonna and Child, also in the Gallery's collection. The two Virgins share a graceful turn of the head and wistful expression. Compositionally, however, the two works differ significantly. 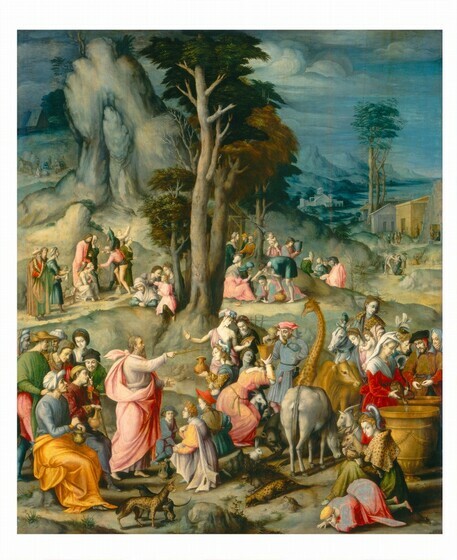 Stock figures from Perugino's workshop repertoire fill his composition. Their gestures are particular, but unrelated and unexplained. In Raphael's painting, by contrast, both figures look out to the viewer, a unifying device he would have seen in terracotta reliefs by Luca Della Robbia. The figures' interlocked gestures reveal another and more important source of inspiration: Leonardo. 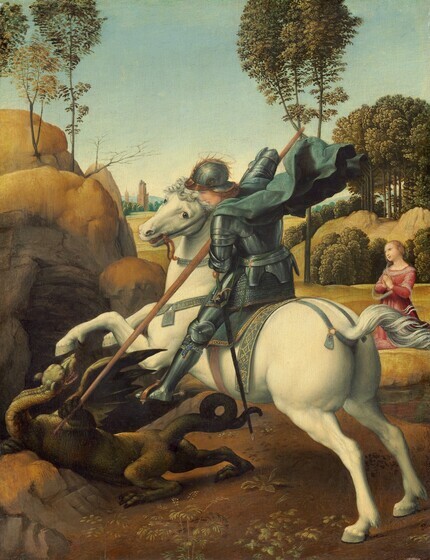 This panel—one of the best-known images of Saint George—was meant to be seen at close range. Its highly detailed and precise setting is reminiscent of the Netherlandish paintings then popular with Italian patrons. It appears, in fact, that Raphael may have copied some landscape motifs from Hans Memling's Saint Veronica. Other elements of Raphael's painting were inspired by Leonardo's cartoon for the fresco of The Battle of Anghiari, a work that Giorgio Vasari (1511–1574), author of Lives of the Painters, said first drew the younger artist to Florence. The rearing horse and the rider's fluttering cape can be traced through Raphael's own drawings of Leonardo's influential design. Raphael used the diagonal thrust of the saint's lance to organize and energize the entire composition with a tightly knit, dynamic naturalism. George was patron saint of England and of the English Order of the Garter. The ribbon tied around his calf reads honi, opening of the order's slogan Honi soit qui mal y pense (disgraced be he who thinks evil of it). 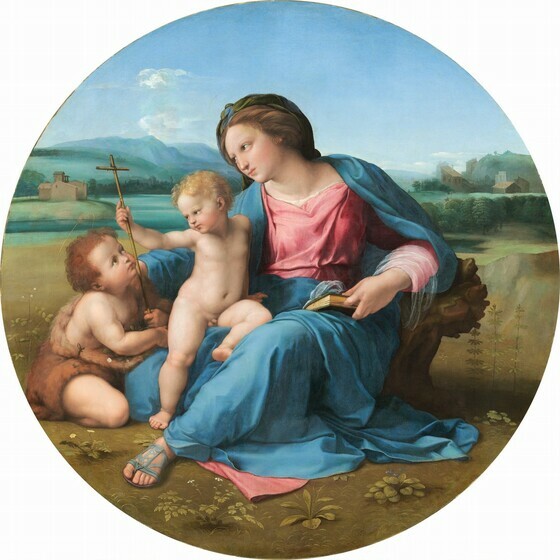 It was once thought that the duke of Urbino had commissioned Raphael to paint this as a gift for King Henry VII of England after the duke was inducted into the English knightly order. It now seems more likely that it was intended for the king's envoy instead. In either case, the commission signals Raphael's growing prestige. In Raphael's Niccolini-Cowper Madonna, large figures nearly fill the frame to concentrate attention fully on mother and child. Although presented in a moment of tender, maternal exchange, their increased size gives the pair a new monumentality. This and the infant's energetic outline suggest that young Raphael had been studying the works of Michelangelo as well. 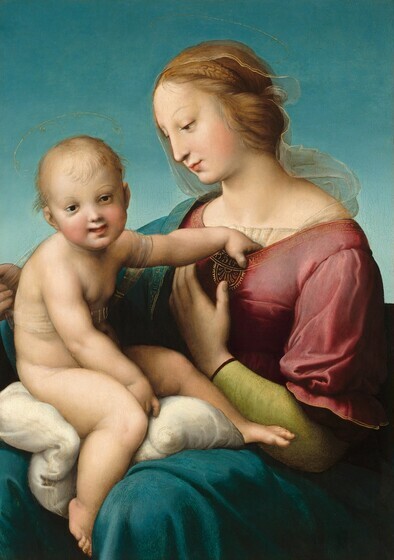 The Alba Madonna stands out as the most important painting in the United States from Raphael's time in Rome. There he continued to respond creatively to new artistic stimuli, combining old and new influences with his own inventive imagination. The round format of this painting, for example, was popular in Florence, yet this picture looks very different from his more intimate Florentine madonnas. Its grandeur suggests greater seriousness. The Virgin's pose resembles a work of classical sculpture. Also, she no longer wears contemporary dress but the robes of ancient Rome, and the landscape has become an idealized view of the Roman campagna. Addition of a third figure, the infant John the Baptist, creates a broad and stable group that is fully integrated into the setting yet dominates the space effortlessly. No longer part of an iconlike devotional schema, these full-length figures appear to be a natural part of the environment. The focus of their gestures and glances is centered on a slender reed cross that actually defines the work's meaning. Church doctrine holds that from birth Christ had an "understanding" of his fate. Here he accepts the cross of his future sacrifice, an action understood as well by his mother and cousin. 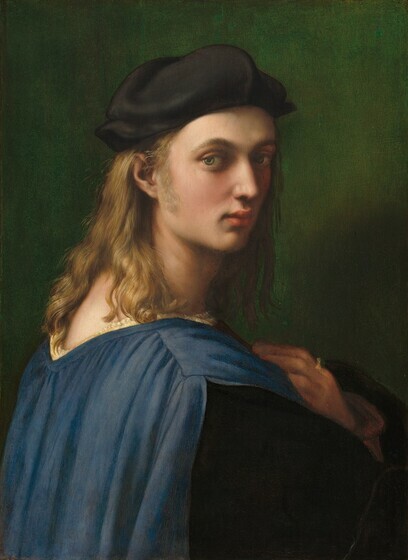 This arresting image was thought in the nineteenth century to be a Raphael self-portrait. However, we know today that this handsome young man was Bindo Altoviti, a wealthy Florentine banker and friend of the artist in Rome. He turns in a dramatic, almost theatrical, way to fix the eye of the viewer. Perhaps one viewer in particular was meant to receive his captivating look: Bindo's wife Fiammetta Soderini. Renaissance poets and courtiers were unanimous in believing that a person first fell in love through the eyes. They were called the "guides of love," which could "reveal the passion within more effectively than the tongue itself, or letter, or messengers." Bindo's flushed cheeks contribute to the impression of passion, and a ring is prominent on the hand he holds above his heart. The robe slipping from his shoulder reveals a bare nape caressed by soft curls. Their golden color would have underscored the nobility and purity of his love. Bindo and Fiammetta, daughter of a prominent Florentine family, were married in 1511, when Bindo would have been about twenty. The couple had six children, but Fiammetta continued to live in Florence while Bindo's business with the papal court required his presence in Rome. This portrait, which apparently hung in the couple's home in Florence, would have provided Fiammetta with a vivid reminder of her absent husband. It remained in the Altoviti family for nearly three hundred years. Various explanations are given for Francesco d'Ubertino Verdi's nickname, Bacchiacca. It is tempting to see a connection with abbacchiare or bacchiare, Tuscan words used to describe harvesting of nuts or olives—this painter "harvested" figures, motifs, and landscape elements from many sources. In this one painting is a crag from a Lucas van Leyden print, a bare-breasted woman derived from a Raphael, heads based on Michelangelo drawings, and a kneeling figure from one of Bacchiacca's own paintings. Among all these creatures only the quail relate to the biblical story. A day after the birds arrived to alleviate the Israelites' hunger, God provided manna from the sky. Here Moses—in bright pink, light emanating from his head—commands his people to gather the almost invisible bread. Perhaps this painting was part of a campaign to depict Cosimo as a new Moses, one who would provide the Florentines with prosperity—an abundance suggested even in the fullness of Bacchiacca's composition.